You can really tell we are in an election year by the number of signs that are popping up all over. What some of you may not know is that each municipality has different by-laws around signs – when you can place them, where you can place them and when they have to be removed. There was an interesting letter to the editor in the Times Colonist on Saturday speaking about exactly this and how sign placement effects who they vote for. For those of us who drive through Saanich or Victoria, we would see the plethora of signs on what seems like every available green space. Boulevards, parks, planters….they are everywhere, and to me look very messy. I almost feel assaulted by the sheer number everywhere I look. In Oak Bay however, the sign by-law is quite specific. We are not allowed to put signs up until 30 days prior to an election. We must remove signs within 7 days of the Election Day and – to me the most important one – we shall not erect signs on public property, or where they could interfere with traffic safety. There is also an understanding that we will not place signs on a boulevard, or on the lawn of a resident without their explicit consent. Now – I am a rule follower. So I go out of my way to try to ensure that my signs are only placed where I have the consent of the resident of the property and I instruct my sign installers to NOT put my signs on public property. Unfortunately it seems that not all candidates follow the same philosophy as I do. I am seeing more and more signs on public property (ie municipal boulevards, municipally owned houses, the corners of the golf course, the university grounds etc.) and I am having numerous people approach me telling me that candidates are putting signs on their lawns and adjacent boulevards without their permission. 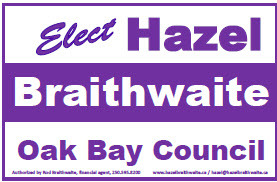 I find this extremely frustrating as what we are seeing is a number of candidates following the rules and a number of candidates basically turning their backs on the written by-laws of Oak Bay – where is the integrity in that?? So, if you look out your window and see a candidates sign on your property or adjacent boulevard that you did not ask or give permission for, I encourage you to take it down. Or, if you are driving along the road and see a sign in a public place like a municipal boulevard, call the Municipal elections officer, Gary Nason and let him know and ask to have it removed immediately. One has to wonder that if these candidates can’t follow by-laws during the election, how can they then enforce by-laws when sitting as a councillor?? I think the writer of the letter to the Times Colonist had it correct – don’t vote for people who can’t follow the rules and who erect their signs on public property.